Today we’d like to introduce you to Chris Cook. I have been an artist for as long as I could remember… but figured out quickly as a young adult that making a good living in fine art would be tough. So I changed my study to commercial art and design. After working as an art directory/creative director in various ad agencies in the metro Atlanta area, I started a graphic design company in downtown Conyers called Quantum Grafix. This was a traditional design shop creating logos, posters, brochures, illustration and flash animation for cities, banks, manufacturing, recycling and other marketing companies. After four years into this business direction, we decided to concentrate only on website design. I started Wave Mechanix, a true internet design studio since most web design at that time was being handled by ad agency divisions with just a few folks. We landed and built the City of Conyers’ first website ever and also the Georgia International Horse Park website for the Olympics in Atlanta as our first two jobs! I have never looked back and have continued to design and build websites to this day. Things in the beginning really took off and we could not keep up with the work. 4-5 years into the web venture, the “dot com” bubble burst. Then when the recession hit years later, the whole website design business really slowed down. We survived the recession partially because we had partnered with an ad agency but stayed totally independent. We were able to help them with traditional graphic design to supplement the website work. 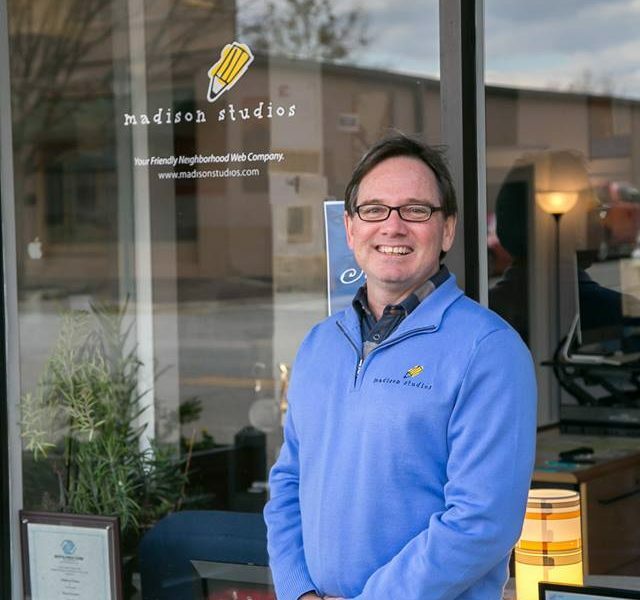 I separated from the agency eventually and started Madison Studios in Madison, Georgia out of my home with a hand full of clients, tons of experience and faith that I could make a new start of it with small business. So let’s switch gears a bit and go into the Madison Studios story. Tell us more about the business. As a fine artist and an experienced designer, I have a unique visual approach to website design. We have a wonderful reputation of not talking above people’s head, taking the time to explain in as simple terms as we can marketing, technology and about their website so that clients are not as intimidated with web and tech. Then they can learn to trust us in what they cannot completely comprehend. We really care about the success of our web and marketing efforts as we see these same clients at local events, our neighborhoods, church, eating at restaurants and out socially. We pride ourselves in helping our clients compete head to head online with larger competitors. We also have some very long term clients that have trusted us for 5-10 years and have built and redesigned their websites to keep up with their growth and ever changing trends and technology. I have a strong faith so not 100% sure I believe in luck, so I don’t consider it so much of a role. I do know that I do not have total control over things concerning business, new business, employees, etc. You can’t always “create” the need for your services, nor control whether your company is chosen or another. We stay aware of the constant changes in the industry and continually adapt our business to offer modern solutions for the ongoing success of our clients.